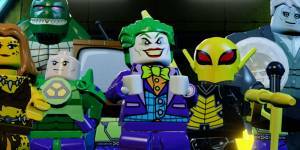 Lego DC Super-Villains is an action-adventure game played from a third-person perspective, it is a spin-off to the Lego Batman trilogy and the fourth installment in the Lego DC franchise. The core gameplay follows in the same style as past Lego games, alternating between various action-adventure sequences and puzzle-solving scenarios. Darkseid has invaded the Earth and the Justice League is missing and its up to you and your fellow Super-Villains to put your differences aside and team up to stop him. For the first time, a LEGO game is giving yo the ability to play as a super-villain, unleashing mischievous antics and wreak havoc in an action-packed, hilarious story.